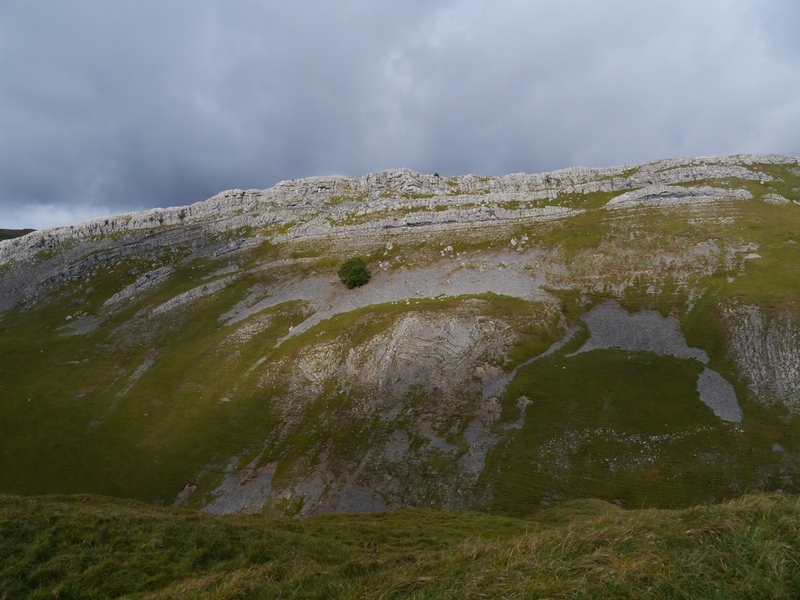 A fascinating exploration of the limestone uplands above Brough including Mount Ida, Barnarm Scar and Musgrave Scar. The bridleway went through this waterlogged gateway - I didn't! I’ve lost count of the number of times I’ve driven along the A66 and cast a more than interested glance up at the limestone heights above the village of Brough. This walk therefore was a long overdue exploration of the area visiting the summits of Barnarm Scar, Mount Ida and Musgrave Scar. With none of the above three summits seemingly accessible by a path, and with Musgrave Scar located within the boundary of the Warcop Army Range, it promised to be a fascinating and potentially challenging walk. The first thing to do was find a suitable parking spot. Originally I’d planned to start from Brough itself but thanks to Google Street View I found that there was ample parking at the end of Helbeck Road just before the entrance to the quarry. I was late setting off for this walk and didn’t arrive at the parking area until 1pm. It had rained heavily overnight and during most of the morning and I was hoping the forecast for a drier afternoon would prove correct. I was delighted therefore to arrive at almost the exact moment patches of blue sky began to appear overhead. I was even happier when sun began to shine down on me as I set off along the gravel track below the quarry. In no time at all I arrived at the eastern end of an impressive limestone scar called Carry Band. From there I took a path to the left leading over the grassy bumps of Spoonymire Hill and the curiously named Horse Shoe to reach Barnarm Scar. Although the lowest of the three tops on the walk the sudden upthrust of limestone is quite dramatic and the views across the Eden valley to the northern Dales and the Howgill Fells were superb. Perhaps the most impressive view though was the steep slopes of Mount Ida immediately to the north. A direct approach on to Mount Ida from the foot of Barnarm Scar looked impractical so I followed a broad path back east towards Carry Band until I came across a thin path that I’d spotted earlier angling upwards. I then made a beeline for the top of Mount Ida, having to cross a wall on the way. The summit, a small knoll surrounded by limestone, was topped by a cairn and views even better than Barnarm Scar. To the north-west I could clearly make out the trig point atop Musgrave Scar my next destination. Although there was no path as such the limestone and grass was easy to walk on and so again my approach was fairly direct. I’d not gone far when I suddenly came across a superb slanted limestone pavement, possibly the finest that I’ve come across outside the boundary of the Yorkshire Dales National Park and probably better than many that are within it. At grid reference NY787171 I crossed into the boundary of the Warcop Range. Although I’d picked one of the designated access weekends technically access is only on public rights of way of which none go to the top of Musgrave Scar. When I arrived at the top and looked down over the range and saw parked cars along Musgravefell Lane below I suddenly became very conscious of the bright red fleece I was wearing and that I was in full view of anyone below. My original intention had been to descend north-west from Musgrave Scar and then follow Musgravefell Lane to the public bridleway at grid reference NY779187. Unfortunately along the lane before the bridleway there was a small green building and another load of parked cars. Whilst it was one thing to enter the range to visit Musgrave Scar it was quite another to brazenly stroll past the cars and building. Therefore after taking a few photos of the dramatic outline of Middle Fell I returned to the trig point on Musgrave Scar and plotted an alternative course to reach the bridleway. In the end I headed north-east aiming for White Rigg which was clearly identifiable by the wall and small limestone outcrops running along its crest. Immediately to the north of White Rigg there was a decent track which I left almost immediately following a bridleway sign. The bridleway soon disappeared at a flooded gateway so instead I followed the modest edge of Johnson Scar until I reached a wall. This I followed until I rejoined the route of the bridleway. The subsequent contouring around Pattinson’s Allotment was quite rough underfoot, the path marked on the map didn’t have a counterpart on the ground. Eventually at grid reference NY802174 I arrived at a good track. I have a suspicion that this is the same track I’d been on briefly behind White Rigg. If this is the case then the whole loop round Watcher Rigg and Pattinson’s Allotment could be avoided. Turning left on the track it led me unerringly for a mile and a half back to the end of Helbeck Road. This was a superb walk in an area that is seemingly rarely visited. The North Pennines is not an area one would readily associate with limestone so the numerous features on this walk were something of a revelation. In retrospect I should have made the small detour to the top of Double Scar but as this is a walk I’d definitely do again I’ll make sure I visit Double Scar next time.